I already have Kaplan & Saunder's, do I still need ATI? ATI is free at my school. You guys have to pay for your ATI books and tests every semester? Elmira College in NY, D'Youville College in NY, Robert Morris University in PA and Wheeling Jesuit University in WV. These are ALL BSN programs with no waitlist and they are accredited. If you have classes already then you take 18 credit hours in ANYtype of class you want. That is actually a plus if your working towards your BSN so I wouldn't suggest dropping out of any class your in. For example if you had A & P, Dev. Psych, English, etc. and you apply to this school and you have all your pre reqs done that they require. You will still have to take 18 credit hours at Mt. Olive College so now you can take ANY class they offer online, or at the Mt Olive RTP campus so lets say you KNOW you want a BSN/MSN/DNP. Since with just a diploma you are basically limited in what you want to do and can do (no advanced practice nurse with just a diploma everyone knows that). You can look at RN-BSN programs around your area and start the pre reqs for those and take those classes at MT. Olive since your required to take 18 credits which you can at that point choose ANY class (statistics, micro, chemistry, spanish) whatever you may be interested in. Watts does not require Micro, Statistics, Chemistry and other pre req courses that MOST BSN and MSN programs REQUIRE. So this could be one of the courses you take so unlike the poster above stated it is NOT a waste to have already finished your prereqs somewhere else and then apply to Watts and take any class of your choosing. I don't see it as useless but if all you want is just a diploma and do not want to advance AT ALL in your career then yes it may be useless but if you want to advance and do more with your RN it is not useless to get pre reqs done for your higher degree with those 18 credit hours. I'm so sorry this happened to you. At least you have the emails so if anything happens and you need to file for unemployment you have something to support your claim just in case you get an appeal. Most unemployment offices have representatives for this sort of thing when there is a dispute among employee and employer and with those emails it looks like you were terminated so you should receive unemployment benefits. I can't comment on what to do since I am still in NS school so I am not going to try to act like I know what your going through but I have been in the unemployment situation before and presently in it. I was laid off in my last job but I also was the offices HR, benefits, payroll, accounts, supply, drug test coordinator person so I can comment on that stuff. Good luck in your job searches. What does "approved" mean? Has anyone seen this? Last year there was a fir tree growing in a Russian mans lung. http://www.dailymail.co.uk/news/worldnews/article-1169861/Shocked-Russian-surgeons-open-man-thought-tumour--FIR-TREE-inside-lung.html Lesson learned stick to meat and you'll be fine LOL. New Balance, Saucony's or KSwiss. I have had flat feet since I was born and I have wide feet so these are the three brands I stick too. I actually have molded foot insoles that my Podiatrist made it took about 4 weeks but they are hand made and molded to the actual shape of your feet. It takes about 2 months to get used to them though and the first 2 weeks they hurt until your feet gets accustomed to them but now I don't wear running shoes unless they're in them. I used to wear Vans all the time in high school, sk8ter shoes rock! Do I really need my books on the first day? The only book I bought so far is my Med Surg book. All the other books I checked out of the school or my city library. They actually have the textbooks that I need. I compared some books since they had new and old editions and 2 books have EXACTLY the same material and the older edition actually provides MORE information:lol2:. So I have these books until middle of September and some early October so that gives me a lot of time to order books online and I think used book prices are raised during the summer since students' need to buy them. Most people don't buy textbooks mid way through the semester like end of September beginning of November since they have already started class which means lower priced used books for me. I also can see if I REALLY will use that textbook before I buy it I hate buying textbooks and we NEVER use it because all info is provided on the Powerpoint. Which class was harder for you? Chemistry that was harder then Patho, Pharm, and Micro COMBINED!!! Then again I HATED chemistry but I LOVE Patho and Pharm so that could be the reason. Conversation starter...what are your nursing career goals? To be...all that I can be....in the hospital! Do you ever wonder about which posters are your classmates? Nope I don't worry about it. But then again I just transferred to a new school so really don't know my classmates. I'm getting a little older so I don't worry much about what others think or worry that I'm being hunted down on the 'net. Also I never say bad things about my school, less stress to deal with :). Speak with an open mind and open heart is what my mama always said. It's a full time job with school and work about 40 hour commitment. I have no kids and not married so I can't comment on that. Is it the hardest thing I've done, nope but then again I was in the Army for 6 years that was wayyyy harder then NS (physically and emotionally) so far. Mentally NS is harder but I like to read and read things ALL the time and I love to learn so I don't see it as being that hard. Anyone can do it if they just put their mind into it I mean it is the most occupied job in America so it's not like it is impossible there are MILLIONS of nurses, so if they can do it you can too! Do you think you'll/have you put on weight in NS? Wow after reading thread I just noticed that some of you guys are size 0, 1 or 2 and worried about losing weight....um...ok. BACK AWAY FROM THE VOGUE MAGAZINE PRONTO! Breathe...eat healthy and exercise you guys do NOT need to focus on your weight. Intervention time. We weren't required to bring books to class and basically everything was on the powerpoint. In clinical we brought our drug books (if you didn't have one on your smartphone) and a pocket nursing diagnosis book. For classes I just brought a binder for the class, a folder to put my information in for that class, and I had a zip up pencil bag that I put pens, highlighters, pencils, etc in. We had a clinical bag that we kept in the Sim Lab so no need to bring anything except for your stethoscope. If your school has lockers you could use that. But I wouldn't lug around all those books unless the teacher says its required. I didn't use a recorder because I don't listen to them plus I make sure to read the chapters for information and I write outlines of information from the chapters, and fill in some notes on the powerpoints from class. In the state of OK tax free weekend is not for school supplies. You get discounts on clothing, shoes and any single item under $100 (except school supplies, backpack, sports gear, basically things for school). I buy my things on amazon anyways that's tax free all year long and I get free shipping. You don't need a pda if you have a blackberry, iPhone, or an Android phone as you can buy software on skyscape or epocrates or get the kindle app for your blackberry or iPhone and buy books through that. 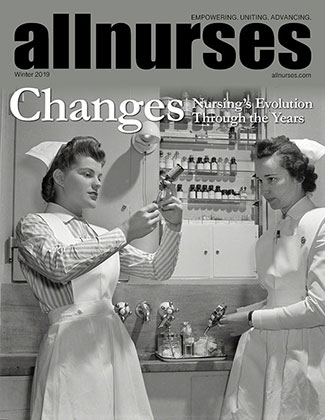 Are nurses becoming more negative on Allnurses? I really don't think it's negativity. It is more the fact that people on here may be more opinionated or assertive then your use to possibly. Opposite opinion then one that you have may seem negative to you but may receive a kudos to someone who shares the same opinion. I don't see name calling on these threads or anyone harrassing or calling people stupid on these threads or being hostile, now that's negativity. An opposite opinion in my book is NOT negative. It is how one voices their opinion that may be negative so a callous person is negative but their view or opinion is not. What would you spend more money on? SHOES!!! If you have poor shoes and poor foot support you WILL feel the ramifications after work or school. You don't feel the ramifications of a decent yet cheaper stethoscope. I have a prestige medical and a Littmann Master Classic but I use the prestige medical one more than the Littmann go figure. Yet I will not spend less than $50 on a pair of running shoes UNLESS that running shoes is on sale or discounted from the original price. Comfortable shoes is more valuable than an expensive scope in my opinion and the more costly or expensive shoe is usually the most comfortable. Awesome amazon.com deal for students - FREE Prime!